The ETL process is a hidden burden within most IT departments. Anecdotally, it accounts for 70% of the effort in a data warehouse setup, and now Big Data is pushing those systems to their breaking point. Existing databases are straining under the weight of the volume and velocity associated with Big Data, and ETL pipelines are creating a bottleneck for applications and analysts who rely on the data flowing through them. When the ETL process is slowed, it creates a ripple effect across the organization. From raising ITs budgets and stress levels to delaying business users access to data, ETL issues cant be ignored. By replacing traditional operational data stores (ODS) like Oracle and MySQL with the Splice Machine RDBMS, Splice Machine can drive ETL lag down from days and hours to minutes and seconds. The Splice Machine RDBMS combines the best of both worlds the transactional integrity and SQL of a relational database with the proven scale out of Apache Hadoop® and Apache HBase® to provide an easier way to scale out the capacity of the ETL pipeline. 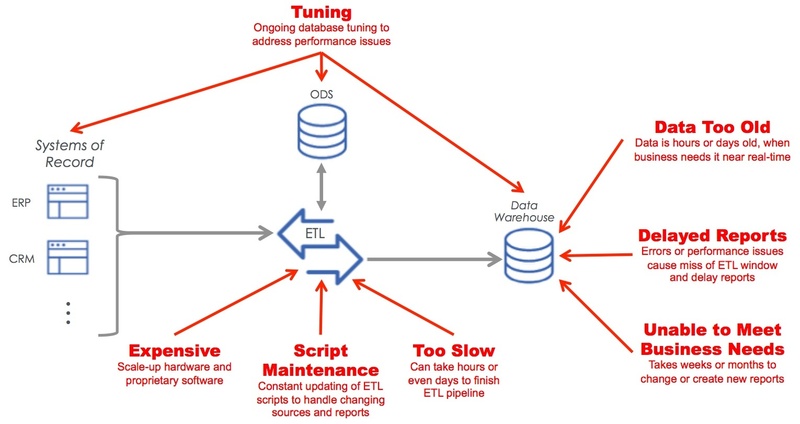 Adding the Splice Machine RDBMS in place of an older ODS removes the bottlenecks that can plague the ETL pipeline, enabling IT departments to hit their ETL deadlines with ease while providing applications and analysts with larger amounts of timely data empowering better decisions to be made faster. While ETL on Hadoop is gaining traction for its scalability, choosing Splice Machine to power the ETL process helps to streamline and hardline the ETL processing pipeline. The Splice Machine RDBMS is able to handle data quality issues, data updates and deletions, and even ETL failures in seconds instead of the hours it can take to reload and restart a MapReduce ETL job.